Today is a layover day. That means we’re staying here for another night to relax and catch up on things. First the injury report: Elizabeth cut her elbow 3 days ago. 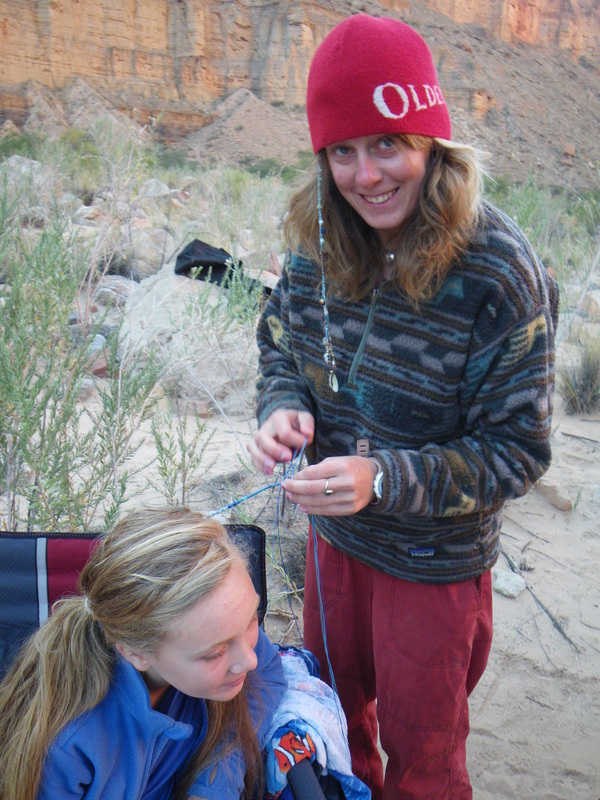 She thinks she cut it on the oar when they ran the hole (hydraulic) in Badger Rapid. Now it is swollen and is probably infected. If it is and we don’t have anti-biotics, we may be looking at an airlift. I plan to at least use the satellite phone and make a call for medical advice. 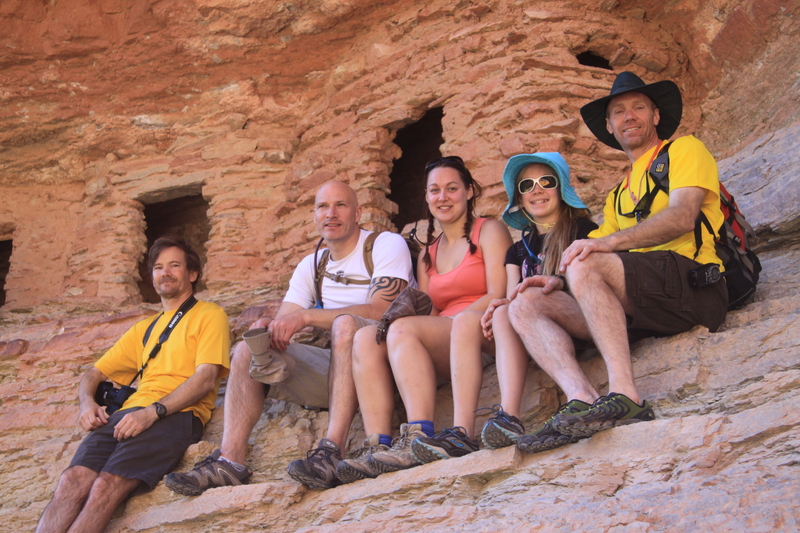 Another group stopped by at lunchtime to do the granary hike. Their trip leader happened to be a physician. He took a look at Elizabeth’s elbow and advised taking Amoxicillin. By coincidence, Captain Shu happens to have some. He’s got just about everything, except a beach rake. Shu’s hand is still puffed up like a balloon, but he has almost full use of it. Craig has a cut on his finger and Gary cut his knuckle. The very ends of my fingertips are getting sensitive to pressure, probably from being constantly dry. This dry desert air is hard on hands. TRIP TIP: bring full-fingered bicycle gloves. Useful for rowing as well as hiking, they protect the hands from the sharp, abrasive rocks and gritty sand, yet breath well and dry quickly. The afternoon was busy, but relaxing. We did laundry, filtered water, and took baths. I built a shower by lashing 3 oars together into a tripod and then covering 2 of the 3 sides with a tarp to give some privacy. Solar showers could then be hung from the top of the tripod. The tripod was placed in a shallow sandbar in the river. (It is required to have all soap dumped directly into the river. 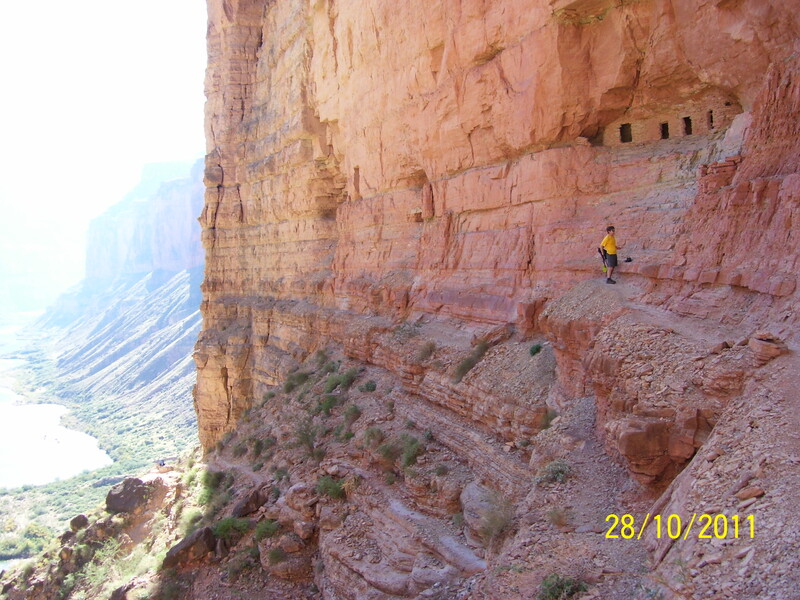 Otherwise with 30,000 people rafting the Canyon every year, the beaches would quickly become polluted.) The beach was further screened from the rest of the camp by tamarisk bushes. 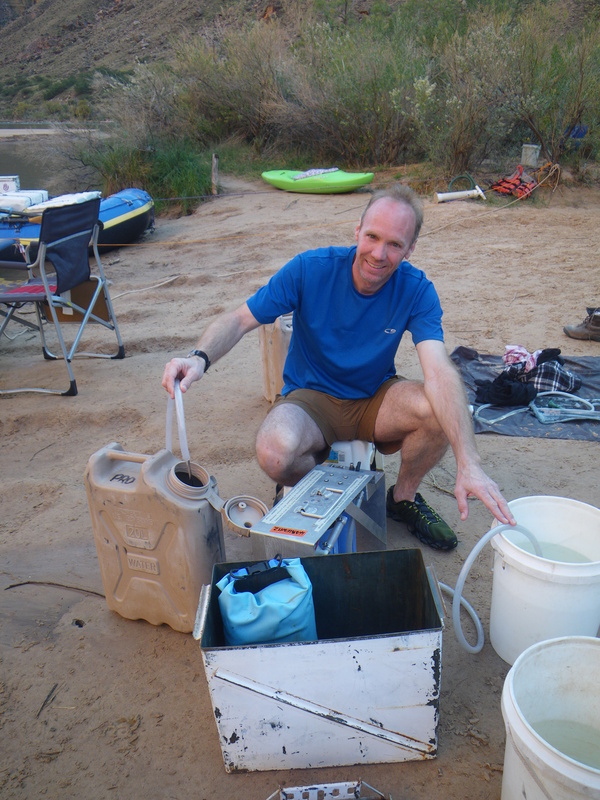 When the bathing was done Captain Shu helped me filter water and refill the water jugs. 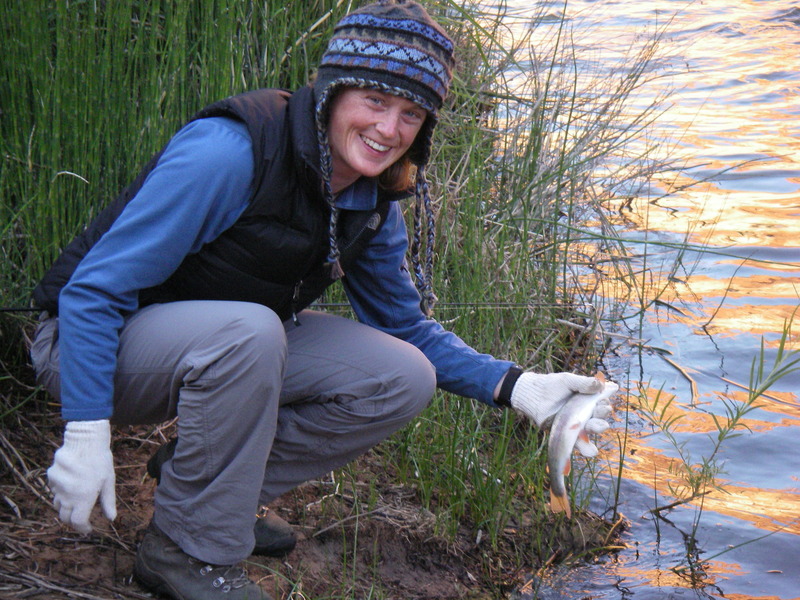 In the afternoon Kathleen proved the trout were no match for her marine biologist skills. 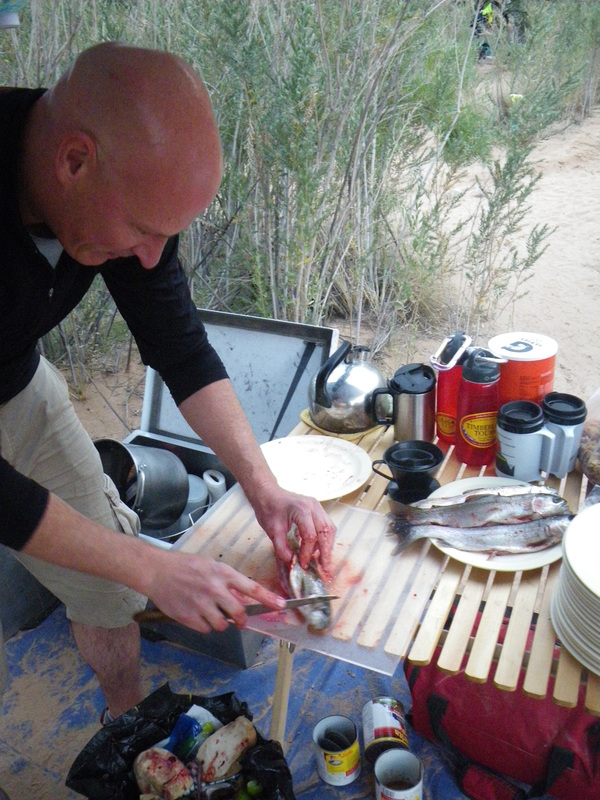 She caught 5 and Gary eagerly demonstrated his culinary skills in preparing them to supplement our fajitas for dinner. In the evening, Ariel played her cello for awhile and then Jay and I had a guitar-violin jam session. Jay has a great collection of tunes in his repertoire that are conducive to the audience singing along. I’ll have to get a copy of his song list so I can find the violin versions and play along. The two instruments compliment each other well. Such a peaceful night. just a light breeze occasionally blowing, making the campfire smoke chase people sitting around it. This has been a fantastic day and tonight is a beautiful night. But I still can’t convince Ariel we don’t need to set up the tent. At least the tent has a mesh ceiling so we can still watch the shooting stars. 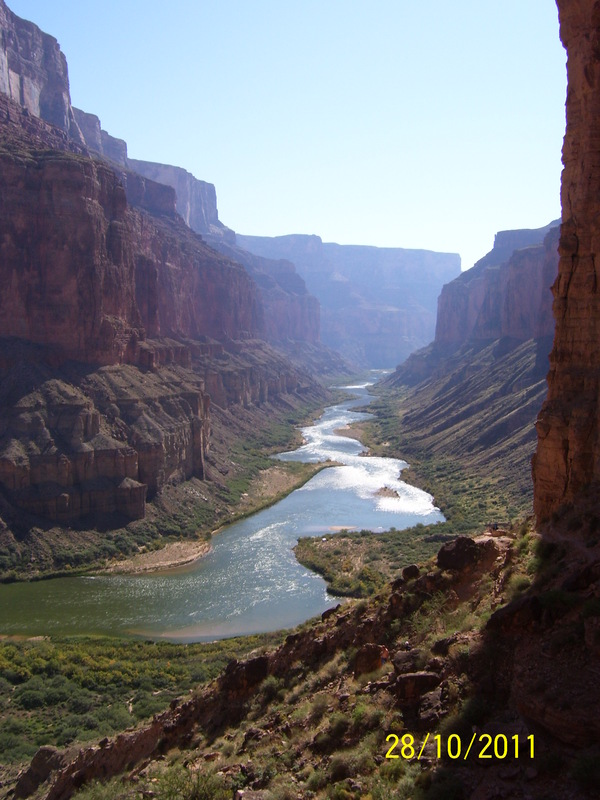 Tomorrow we will be moving on downstream and enter the Grand Canyon proper. 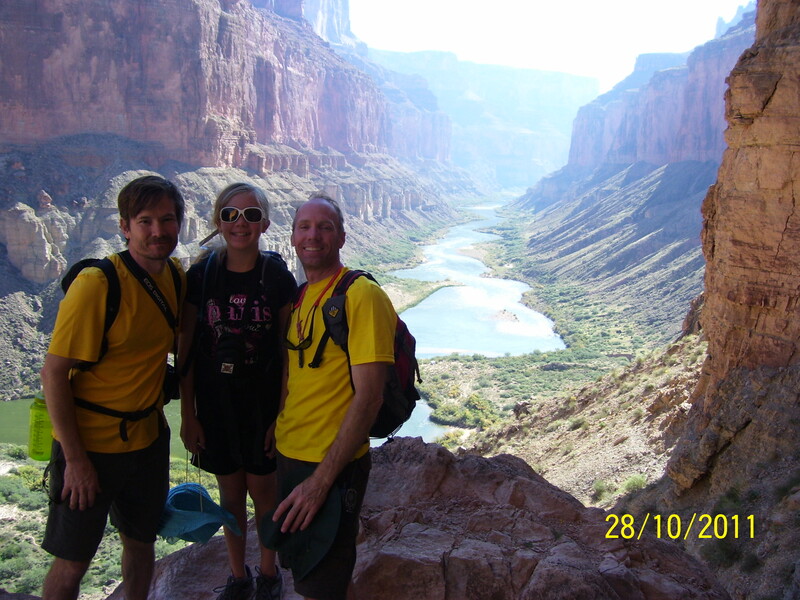 Posted on January 4, 2012, in Grand Canyon 2011 and tagged adventure, expedition, granaries, Grand Canyon, nankoweap, rafting. Bookmark the permalink. 6 Comments. I agree completely with Dave – DO THIS WITH YOUR KIDS. I Did a shorter trip with my 2 teen daughers this summer. It was great. No texting their friends… cause no reception in the canyoun… good bonding time! Yes, lots of Bag Balm and hand lotion strongly recommended. Also, get a doctor to prescribe a variety of meds to take with the trip. Little nicks and cuts can easily become infected. Doing mud baths can be lots of fun but inevitably those little cracks, nicks and cuts can get infected. I never considered the trouble small injuries could possibly cause. And dry, chapped skin! That’s irritating! I loved that Ariel has enjoyed the female company while out there. Nice ladies! 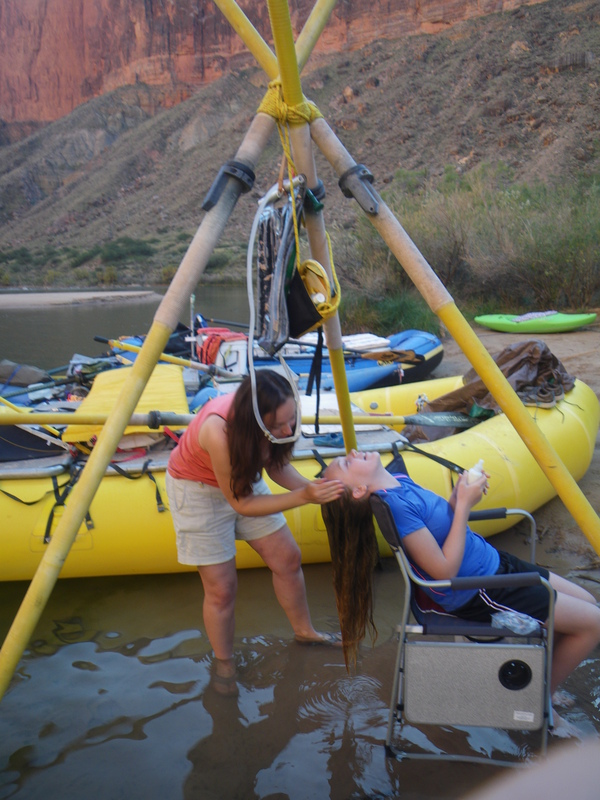 Playing beauty parlor in Grand Canyon-that’s awesome! Is there a point along the trip where you pick up supplies and fresh food? Loved the pictures and never tire of seeing them! No 5 star bathrooms for sure-but even so that shower was I’m sure a welcomed activity. So how cold/cool does it get at night? 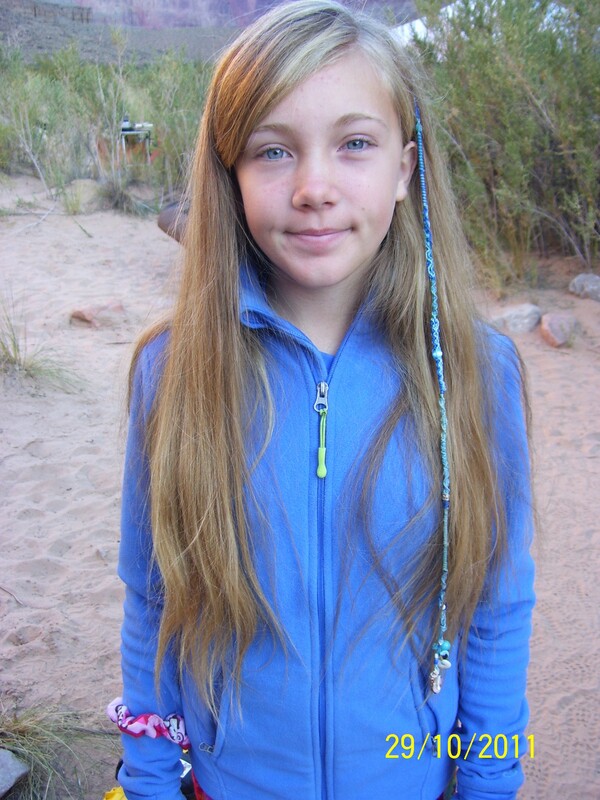 Have you had any encounters with snakes or other wildlife? 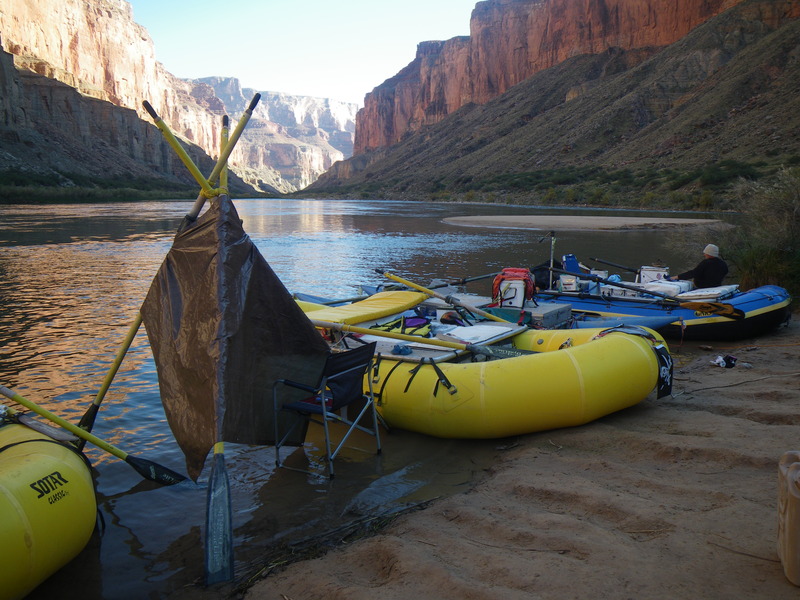 How many people are on the river or camping at a time? Is it busy with people or very remote feeling? Please tell me there isn’t any garbage lying around-that just burns me every where we go seeing that!!! So everybody got acquainted at the first meeting? Wow, fun to meet new people-not fun if they turn out to be jackasses though. I agree though, some people have no idea that they are abrasive or annoying to others. Best to try and gently bring it up than just get more angry trying to ignore it. You I’m sure, handled this well David. Your people skills are fine-tuned it seems. : ] Looking forward to the next posts! Thanks for sharing your experiences with us. Fingertips can get dry enough to crack and bleed. Cissy, right now we’re at river mile 53. The next stop for supplies is at the take out, about 175 miles downstream. Well, actually, Phantom Ranch is at river mile 88. You can get an ice cream bar and a coke there and a water faucet with clean water is available too. In other words, what you have at the put-in is what you have for 21 days. Well, with two caveats: you can trade with other groups on the river if you cross paths or… Just keep reading and you’ll see the other option. The nights so far have been down to the low 50’s F (10C) and the highs in the low 70’s (25C). Mostly sunny but more clouds than the last time I was here and already 2 days with some rain. Unusual. It’s not quite as warm as normal, but still comfortable. There really hasn’t been much wildlife yet, except for the occasional raven looking for something to steal, but they haven’t gotten anything from us, at least not yet. We haven’t seen any fire ants yet, thankfully. They’re the same ones you have in Florida. Sometimes campsites get taken over by them if groups have been sloppy about their food. More on the kitchen later too. The day we put on the river, there was one other group launching. There was only one group that put on the day before us and one for the day after us, so we won’t see much of the other people on the river. Everyone travels at different speeds, targets different hikes and camps at different beaches usually. Today was the first time we encountered another group since we launched. That was the group that put on the day after us. They’re going faster here to get to more hikes further down. Great questions, Cissy. More on all of these topics later too.